Although the transcription factor Pax6 plays an essential role in neurogenesis, layer formation and arealization in the developing mammalian cortex, the mechanisms by which it accomplishes these regulatory functions are largely unknown. Pax6 and the ETS family transcription factor Er81, which is presumed to play a role in the specification of a sublineage of layer 5 projection neurons, are expressed with a prominent rostrolateral-high to caudomedial-low gradient in cortical progenitors. In the absence of functional Pax6, progenitors do not express Er81 and the rostrolateral cortex lacks Er81-positive layer 5 neurons. In this study, we investigated the transcriptional regulation of Er81 and provide evidence that Er81 is a direct target of Pax6. We identified and analyzed the regulatory function of an evolutionarily conserved upstream DNA sequence in the putative mouse Er81 promoter. Three potential Pax6 binding sites were identified in this region. We found that the presence of one of these sites is necessary and sufficient for full activation of the Er81 promoter in Pax6-transfected HeLa cells, while other still unknown factors appear to contribute to Er81 promoter activity in cortical progenitors and neuronal cells. The results suggest that endogenous Pax6, which is expressed at the highest level in progenitors of the rostrolateral cortex, exerts region-specific control of Er81 activity, thus specifying a subpopulation of layer 5 projection neurons. We conclude that the genetic interplay between the transcription factors, Pax6 and Er81, is responsible, in part, for the regional specification of a distinct sublineage of layer 5 projection neurons. In the mammalian neocortex (pallium), neurons with striking morphological and functional diversity are organized radially in six layers, and tangentially into numerous functional domains. Only recently have the molecular and cellular mechanisms that guide the process of corticogenesis responsible for this organization begun to be resolved [1, 2]. The main source of cortical projection neurons is the population of pluripotent radial glial progenitors (RG), which divide asymmetrically at the apical surface of the ventricular zone (VZ) and generate both neuronal and glial progeny . After midgestation, RG generate neuronal progenitors, termed intermediate or basal progenitors (BPs), that divide symmetrically at the basal surface of the VZ and in the subventricular zone (SVZ). Thus, while the asymmetric division of RG progenitors gives rise to progeny with distinct cell fates, the symmetric division of BPs primarily modulates the number of cells in previously established neuronal cell lineages . The projection neurons of the lower (6 and 5) and upper (4–2) layers are generated predominantly from early (E12-E14) or late (E15-E18) progenitors in the two germinative zones, VZ and SVZ, respectively. Although generated during a specific developmental window, each neuronal layer consists of molecularly distinct neuronal subtypes that arise sequentially [5–7]. For instance, the majority of layer 5 neurons that extend corticospinal projections express the transcription factor, Er81 , while another set of layer 5 neurons, marked by the expression of the homeodomain transcription factor, Otx1, make connections with the superior colliculus and pons . Thus, laminar fate is presumably determined not only by the timing of neuronal origin during distinct developmental stages, a process controlled by environmental cues , but is also critically dependent on intrinsic mechanisms that control the molecular phenotype of the neuronal sublineages . The mechanisms that control the restricted expression of molecular determinants in distinct classes of neurons during corticogenesis remain unknown. Our previous results, as well as those of other groups, have indicated that neurogenic RG progenitors are intrinsically specified by the expression of Pax6 . In the absence of Pax6, as exemplified by Pax6/Small eye homozygous (Sey/Sey) embryos, cortical progenitors produce less than half the normal number of neurons; conversely, retroviral-mediated Pax6 overexpression in cortical progenitors in vitro results in expanded production of neuronal progeny [11, 12]. Pax6 is strongly expressed in early progenitors and, although it directly regulates the activity of the neuronal determination gene, Ngn2 . Ngn2- and Pax6-controlled genetic programs appear to specifically and separately determine the neuronal fate of lower and upper neurons . Thus, Ngn2 knock out (KO) and Sey/Sey embryos exhibit selective misspecification of lower and upper cortical layer neurons, respectively . Intriguingly, however, in the absence of Pax6, cortical progenitors fail to express the layer 5-specific marker, Er81, which instead exhibits enhanced ectopic expression in the SVZ . We have noted qualitatively similar mispatterning of Er81 expression in the rostrolateral cortex in the cortex-specific conditional Pax6 KO mice at juvenile and adult stages (T.C.T., A.S. unpublished observations), prompting us to examine possible genetic interactions between the two transcription factors, Pax6 and Er81. Here we report the identification of a 2-kb promoter sequence of the mouse Er81 gene that drives Er81 expression in a subpopulation of cortical layer 5 neurons. We demonstrate that Pax6 directly controls Er81 activity in both cortical progenitors and in a subset of layer 5 projection neurons. The results further suggest that the cell fate specification of Er81-positive layer 5 neurons in the rostrolateral cortex is a Pax6-dependent process. DNA sequences with significant gene regulatory functions are highly conserved during evolution. A comparison of the Er81 locus from mouse, rat, chimpanzee and human revealed the existence of a highly conserved sequence of approximate 2 kb in the 5' region of the putative Er81 promoter. To identify potential Pax6 consensus binding sites  in this region, we utilized the sequence analysis package GCG . We discovered three potential Pax6 binding sites located at positions -113 to 148, -1190 to 1225, and -1530 to 1565 upstream of the mouse Er81 gene, each of which contained three, four or five mis-matches relative to the consensus Pax6 binding sequence . Using an electrophoretic mobility shift assay (EMSA) and in vitro-translated Pax6 protein, we examined Pax6 binding to these three potential binding sites. The results indicate that Pax6 bound with low affinity to the Pax6 binding site at position -1190 to -1225, but not to any of the other putative sites (Fig. 1B, lanes 3 and 6 and data not shown). To determine whether this low-affinity binding was specific, we pre-incubated binding mixtures with an anti-Pax6 antibody and found that protein-bound, radiolabeled probes were supershifted, confirming the presence of a DNA-Pax6 protein-Pax6 antibody complex (Fig. 1B lane 7). Pax6 binding was also completely abolished after mutating the binding site sequence in the Er81 promoter (Fig. 1A,B lanes 9, 10). Together, these findings indicate that Pax6 interacts specifically with the -1190-1225 regulatory sequence of the Er81 promoter. Pax6 bind specifically to a putative Er81 promoter. (A) The schematic depicts the putative Er81 promoter, showing the relative positions of a potential Pax6-binding site (BS) and an external control sequence used for ChIP assays (see below). A comparison of the DNA sequences for the potential Pax6-binding site identified in the putative Er81 promoter (at position -1190-1225), the perfect Pax6-binding site (Cons), and the mutated site (Mut) is also indicated. (B) EMSA analysis of Pax6 binding to 32P-labeled probes corresponding to the potential Pax6 binding site, a perfect Pax6-binding site, and a mutated site. The arrows, open arrowhead and closed arrowhead indicate free probes, probe-protein complexes, and probe-protein-antibody complexes, respectively. Binding of Pax6 to its perfect Pax6-binding site (lane 3) and potential binding site in the putative Er81 promoter (lane 6) is clearly detectable. Probe binding is not observed using the TNT rat reticulocyte lysate (RRL) as a protein control (lanes 2, 5). 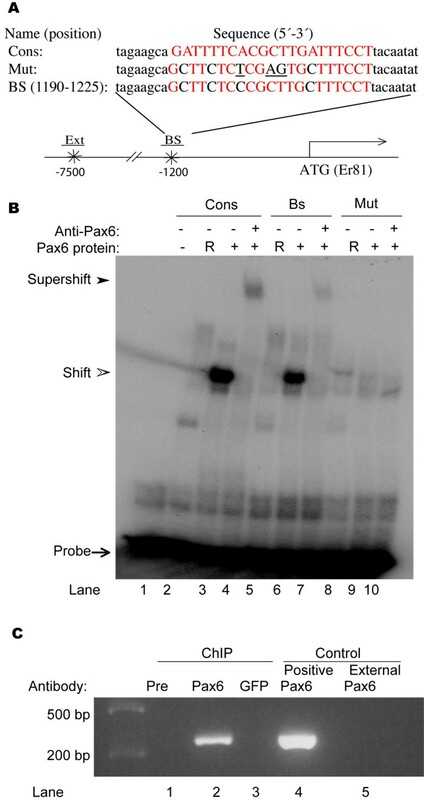 Binding specificity was confirmed by pre-incubating with an anti-Pax6 antibody, which resulted in a super-shifted DNA-Pax6 protein-Pax6 antibody complex (lanes 4, 7). Binding of Pax6 was completely abolished by mutation of the Pax6 binding-site sequence in the Er81 promoter (lanes 9, 10). (C) ChIP assay. Pax6 antibodies precipitated chromatin containing the Pax6 binding site in the region -1322 to -1040 of the Er81 promoter (lane 2), but were unable to precipitate chromatin isolated from a region outside of the Pax6 binding site (lane 4). Preimmune serum (lane1, Pre) or GFP (lane3) antibodies failed to precipitate chromatin. To determine whether this binding site is occupied by Pax6 protein in vivo, we performed chromatin immunoprecipitation (ChIP) assays using mouse E15.5 cortical extracts. A 282-bp fragment located at -1322 to -1040 of the Er81 promoter encompassing the Pax6 binding site was precipitated from chromatin by the Pax6 antibody (Fig. 1C, lane 2), but not by pre-immune serum (Pre) or GFP antibody (Fig. 1C, lane 1 and 3). Furthermore, the Pax6 antibody was not able to precipitate a control chromatin fragment isolated from a region outside of the putative Er81 promoter (Fig. 1C, lane 5). These data indicate that Pax6 protein binds specifically to the putative Er81 promoter both in vitro and in vivo. Significantly, the identified Pax6 binding site is also present in the 2-kb upstream-region of the Er81 gene of mouse, rat, chimpanzee and human (data not shown) and in zebrafish , suggesting that this binding site is evolutionally conserved. We next used deletion analysis to determine the minimal sequence requirements for Er81 promoter activity. A 3.5-kb fragment from the 5' region of the mouse Er81 gene and a series of deletion fragments were subcloned into luciferase reporter plasmids and transfected into mouse primary embryonic (E12.5) cortical cell cultures, as described below (Fig. 2A). The Er81(wt)-Luc construct (p131), containing a 2-kb region of genomic DNA upstream of the Er81 translation initiation codon, was most active in subsequent luciferase assays. Characterization of the Er81 promoter. (A) Diagram to the left indicates the relative size of deletion constructs used in the reporter assay. The horizontal lines represent deleted fragments of the putative Er81 promoter. Diagram to the right shows the corresponding reporter activities of the indicated deletion constructs in primary cortical cell cultures, expressed as mean ± standard deviation (error bars) in each assay. The asterisk masks the construct, p131 with the highest luciferase activity among other deletion constructs. (B) Multiple sequence alignment of the mouse, rat, chimpanzee, and human Er81 genes was performed using the ClustalW algorithm implemented in the eShadow web application . The x- and y-axes indicate the distance (in base pairs) to the starting codon (0) and percentage variation, respectively. The resulting alignment indicates a highly conserved sequence of approximate 2 kb upstream of the Er81 gene for all species examined. Schematic representation of the vector used to generate a Cre-transgenic mouse line in which the expression of Er81 is driven by the identified 2-kb Er81 promoter sequence. The Er81 promoter was subcloned upstream of the β-globin minimal promoter (minPr) in a plasmid containing a DNA fragment encoding Cre . This construct allows the Er81 promoter to simultaneously drive expression of Cre via the β-globin minimal promoter, and a GFP reporter sequence via an IRES sequence. (C) After crossing with Gtrosa26tm1Sho reporter mice , LacZ staining of E16.5 forebrains isolated from double-transgenic Er81Cre Gtrosa26 mice showed recombination in the L5, and the VZ of cortex, striatum, piriform cortex, and olfactory bulb (C, cross section; D, sagittal section). CP, Cortical plate; Hi, Hippocampus; L5, Layer 5; OB, Olfactory bulb; Pir, Piriform cortex; Str, Striatum; VZ, Ventricular zone. To assess the ability of Pax6 to activate the Er81 promoter, we transfected HeLa cells, which lack endogenous Pax6 , with Er81(wt)-Luc alone (control) or together with the Pax6-expression plasmid, CMV-Pax6 (Fig. 3A). The control cells exhibited very low basal levels of luciferase activity, whereas co-transfection of Er81(wt)-Luc with increasing amounts of CMV-Pax6 led to robust, concentration-dependent increases in luciferase activity (Fig. 3A). The Pax6 binding site is required for full activity of the putative Er81 promoter. (A) Exogenously expressed Pax6 activated a co-transfected Er81 promoter-reporter construct in HeLa cells in a dosage-dependent manner. (B) Mutation of the Pax6 binding site completely abolished Pax6-dependent luciferase reporter activity of the putative Er81 promoter in HeLa cells. The plasmid combinations used for transfections are indicated. (C) Mutation of the Pax6-binding site led to a significant decrease in Er81 promoter activity in mouse embryonic (E12.5) primary cortical cultures. (D) The putative Er81 promoter exhibited high activity in Neuro-2A cells (compare Er81(wt)-luc construct and control pGL3). Deletion of the Pax6 binding site did not affect activation of the putative Er81 promoter in Neuro-2A cells (compare Er81(wt)-luc and Er81(mut)-luc constructs). (E-K) Pax6 activated an Er81 promoter-reporter construct in ovo. (E) GFP immunoreactivity demonstrates the high efficiency of the electroporation method. (E/F) After co-electroporation of Er81(wt)-Luc and CMV-eGFP, no luciferase-positive cells were detected. 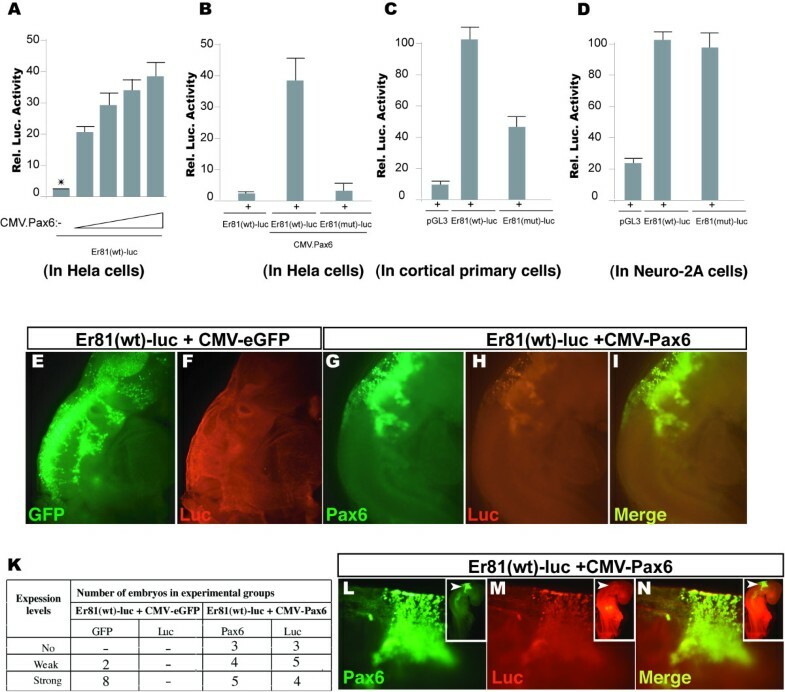 (G-I) Co-electroporation of Er81(wt)-Luc and CMV-Pax6 promoted expression from the Er81 promoter-luciferase reporter construct in hindbrain of chick embryos. (K) The table shows the number of embryos used for immunohistochemical analyses and the results obtained with the indicated antibodies. The strength of the immunohistochemical signal is designated as no, weak or strong staining. Note that the images shown in (E-H) represent strong staining for GFP, Luciferase and Pax6 antibodies. (L/N) Consistently, co-electroporation of Er81(wt)-Luc and CMV-Pax6 in isthmic region, where Pax6 does not express, led to up-regulation of the Er81 promoter-controlled luciferase reporter. Arrows in images for the whole embryo indicated a region where plasmids were injected. Luciferase activity is expressed as mean ± standard deviation (error bars) in each assay. Er81(wt)-Luc, wild-type putative Er81 promoter-reporter construct; Er81(mut)-Luc, mutated putative Er81 promoter-reporter construct. To determine whether Pax6 is also able to activate the Er81 promoter in vivo, we performed in ovo co-electroporation experiments. Er81(wt)-Luc and CMV-Pax6 constructs (or a CMV-Gfp empty vector control), were electroporated into the hindbrain of Hamburger and Hamilton (HH) stage 11–12 chick embryos. After 2 days, embryos were examined immunohistochemically for expression of Pax6, GFP and luciferase reporter. After the forced expression of Pax6 in VZ progenitors of the hindbrain, a marked expression of the Er81-luciferase reporter was detected as compared to the controls (Fig. 3E/I). In developing neural tube Er81 is expressed endogenously only in differentiated motor and proprioceptive sensory neurons, including a subpopulation of neurons of the inferior olive in the hindbrain [20, 21]. Upon electroporation, the injection in the forth ventricle, DNA (through the CMV-Pax6 construct) is incorporated in VZ progenitors and their descendents, seen as strongly luciferase-positive cells leaving the neural tube (Fig. 3H). Consistent results were also obtained when the forced expression of Pax6 was tagged predominantly into the isthmic region, normally being negative for endogenous Pax6 expression (Fig. 3L/M). Together, these results indicate that forced expression of Pax6 can trans-activate the Er81 promoter in both, a cell culture system and a live embryo. To further examine the functional significance of the single Pax6 binding site identified in the Er81 promoter, we mutated the site in the Er81(wt)-Luc plasmid from the original 5' CCCGCT 3' sequence to 5' CTCGAG 3', which does not bind Pax6, generating the Er81(mut)-Luc plasmid (Fig. 1A,B). We then used a reporter assay to assess the Pax6-dependent transactivation of both wild type and mutated constructs. Accordingly, HeLa cells were transfected with Er81(wt)-Luc or Er81(mut)-Luc with or without cotransfection of the Pax6 expression construct, CMV-Pax6. As expected, the activity of the wild-type promoter construct was enhanced by Pax6 overexpression, which increased luciferase activity almost 20-fold compared to the reporter activity in control cells. Mutation of the Pax6-binding site in the putative Er81 promoter completely abolished Pax6-dependent activity in the reporter assay (Fig. 3B). These data suggest that, in Pax6-transfected HeLa cells, a single biologically active Pax6-binding site in the Er81 promoter is sufficient to support full promoter activity. To study how the occupation of the binding site by Pax6 in the Er81 promoter is influenced by the presence of endogenous proteins intrinsic to progenitor cells, we evaluated Er81 promoter activity in primary embryonic (E12.5) cortical cultures. More that 90% of the RC2+ RG progenitors express Pax6 at this stage [10, 22]. The cells were electroporated with either Er81(wt)-Luc, Er81(mut)-Luc or empty pGL3 plasmid (control) and cultured for 3 days in vitro (3DIV) in a chemically defined culture medium (see Materials and Methods; ). Under these conditions, progenitor proliferation and neuronal differentiation in vitro mimic in vivo neurogenesis [10, 24]. 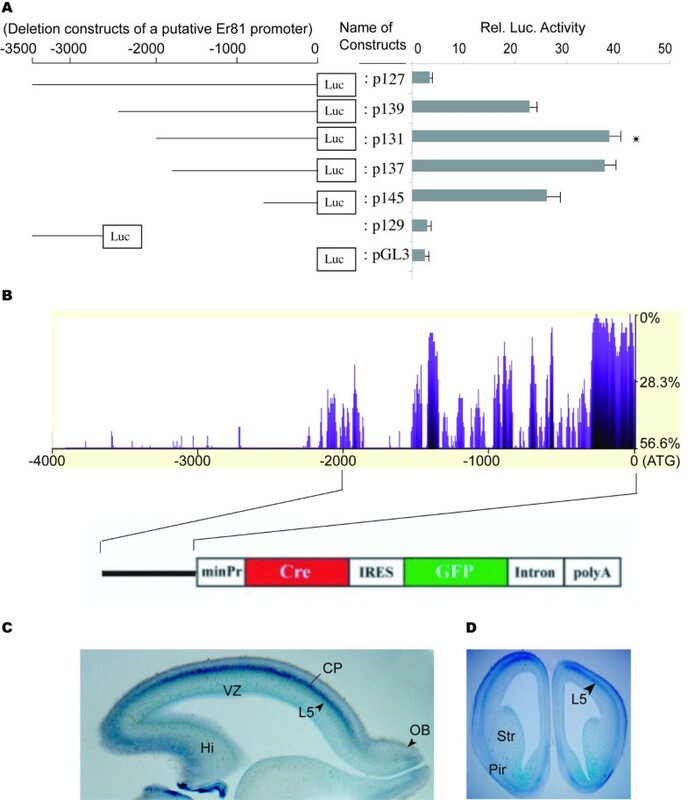 Notably, in contrast to Pax6-transfected HeLa cells, where transfection of the Er81(mut)-Luc construct completely abolished Er81 promoter activity, approximately 42% of the residual luciferase activity remained in primary cortical cultures transfected with this mutant promoter construct (Fig. 3C). These findings indicate that the Pax6-binding site in the Er81 promoter is an important, but possibly not the sole, cis-acting element responsible for regulating the activity of the Er81 promoter in cortical primary cultures. Pax6 is expressed in RG progenitors, but is also present in some differentiated neurons in the adult brain, including some amygdalar nuclei . Upon differentiation, primary cortical cultures contain a mixture of progenitors and different cell types, including neurons and glial cells. To examine the function of the Pax6 binding site identified in the Er81 promoter in a homogeneous neuronal cell population, we performed Er81 reporter assays using the neuronal cell line, Neuro-2A, which expresses little or no Pax6 . Neuro-2A cells were transfected with either Er81(wt)-Luc, Er81(mut)-Luc or pGL3 constructs and cultured for 2 days. In agreement with the results obtained in primary cortical cells, transfection of Neuro-2A cells with the Er81(wt)-Luc construct caused almost a four-fold increase in luciferase reporter activity compared to that in pGL3-transfected control cultures (Fig. 3D). Remarkably, and in contrast to the experiments with Pax6-transfected HeLa cells and mixed primary cortical cultures, transfection of Neuro-2A cells with Er81(mut)-Luc construct had no effect on Er81 promoter activity (Fig. 3D). As noted above, Pax6 binds with low affinity to the Er81 promoter, suggesting that high levels of Pax6 expression may be required to exert transcriptional control on Er81. Under the culture conditions used, Pax6 expression in mixed primary cortical cultures is restricted to the RG progenitors cells. Collectively, these findings strongly suggest that the Pax6 binding site identified in the Er81 promoter is essential for activation of Er81 in cortical progenitors, while regulation of Er81 expression in neuronal cells may depend on other factors. To obtain definitive evidence that the promoter sequences identified in the Er81 gene is capable of correctly driving the endogenous expression of Er81 in the developing brain, we developed an Er81Cre transgenic mouse. This line expresses a DNA construct containing a 2.0-kb fragment of the Er81 promoter placed downstream of a human β-globin minimal promoter, followed by a Cre recombinase DNA sequence, and IRES and GFP reporter sequences (Fig. 2B). Er81Cre transgenic mice were crossed with mice from a reporter line, Gtrosa26tm1Sho , which contain a loxP-flanked DNA sequence of "stopper" fragment positioned upstream of the β-galactosidase-neomycin phosphotransferase fusion gene (β-geo). β-geo is expressed only after Cre-mediated excision of loxP-flanked DNA sequences, and thus double-reporter transgenic Gtrosa26tm1Sho/Cre lines provide a region-specific report of the occurrence of Cre excision by the specific Cre line used . The analysis of LacZ activity at E16.5 in different Er81Cre;Gtrosa26tm1Sho double-transgenic founders revealed expression of the reporter in the VZ and layer 5 of the cortex, striatum, piriform cortex and olfactory bulb, a result that is in agreement with the known pattern of Er81 expression in the mouse telencephalon (Fig. 2C,D; [18, 28]). We therefore conclude that the 2-kb Er81 promoter region is necessary and sufficient for Er81 expression in the mouse telencephalon. Accumulating evidence suggests that the process of cortical layering, during which progenitor cells in the VZ and SVZ generate neurons destined to specific cortical layers, depends on both the temporal sequence of progenitor cell origination during a specific developmental stage and the expression of layer-determinant genes. In addition, neurons of a specific layer exhibit diversity in number, morphology and axonal connectivity across different functional domains of the cortex. Thus, the two fundamental processes of corticogenesis, layering and arealization, seem to be closely related. According to the current view, the functional regionalization of the cortex involves intrinsic mechanisms, controlled by the combinatorial expression of transcription factor gradients in the progenitors, and extrinsic cues provided by the ingrowing thalamocortical axons at late developmental stages and after birth [2, 29]. In the developing cortex, Pax6 is expressed in RG progenitors in a rostrolateral-high to caudomedial-low gradient [30, 31] and plays essential roles in cortical neurogenesis, and arealization and layer formation [10, 12, 14, 25, 30, 32–37]. Accordingly, abolishing Pax6 function leads to defects in cortical molecular regionalization as observed in the Pax6/Small eye brain, where the rostral cortical area shrinks and caudal areas expand [38, 39]. Furthermore, there is a decrease in the number of neurons in the Pax6-defficient cortex, in which the neuronal subsets of the upper cortical layers appear to be specifically missing [14, 34]. In the current study, we provide the first evidence that Pax6 may determine the neuronal identity of subsets of layer 5 projection neurons by controlling the expression of Er81 in pallial progenitors. Er81 is a member of the Pea3 subfamily of the ETS transcription factor family  that is expressed in cortical progenitors at the mid- to late stages of neocortical development in mouse , rat and monkey . In the mouse cortex, Er81 transcripts are first detected at E13 in the VZ of the rostrolateral pallium; expression is maintained in a subset of the pyramidal cells in the lower part of layer 5 in later embryonic stages and in the mature brain. . ETS proteins have been shown to contribute to the specification of various cell types in vertebrates and invertebrates . The documented role of Er81 in the specification of dendritic arborization of proprioceptive sensory neurons in the spinal cord  suggests the possibility that Er81 might be involved in the neuronal subtype specification of projection neurons in the cortex [18, 28]. Similar to Pax6, Er81 is also expressed in a prominent, graded manner in pallial progenitors, reaching its highest levels in the rostrolateral cortex [28, 44, 45]. In the absence of Pax6, Er81 expression in the VZ of the rostrolateral cortex (where endogenous Pax6 expression is highest) is essentially undetectable, both in Sey/Sey mutant  and in the juvenile cortex of the conditional cortex-specific Pax6KO mutant, (T.C.T and AS, unpublished data). We show here that Pax6 binds with low affinity to a single binding site in the Er81 promoter, and further show that Pax6 protein produces dose-dependent increases in the activity of this promoter. Collectively, these findings suggest that Pax6 controls the generation of Er81+ layer 5 neurons in a dose- and region-specific manner, predominantly in the motor and frontoparietal cortex. Remarkably, similar region- and dose-dependent regulation of Er81 expression by the neurogenic factor, Ngn2, was demonstrated in Ngn2-KO mice, in which Er81 expression is specifically affected only in the rostral cortex . Ngn2 is a direct Pax6 downstream target gene whose expression is regulated by high levels of Pax6 expression only in progenitors of the rostral pallium [13, 35]. Additional experiments will be required to determine whether Er81 expression in the rostrolateral cortex is regulated coordinately by Pax6 and Ngn2 or, alternatively, whether Er81 acts as a downstream regulator in the Pax6-Ngn2 pathway. We found that the Pax6-binding site identified in the 2-kb promoter fragment of Er81 was necessary for full activation of the Er81 promoter by Pax6 in Pax6-transfected-HeLa cells. However, mutation of the Pax6-binding site only partially reduced Er81 promoter activity in primary cortical cell cultures and had no effect in neurons of the Neuro-2A cell line. Given that at 3DIV, cortical primary cultures consist of approximately 45 % progenitors and 55% differentiated neurons [10, 22], these findings suggest that activation of Er81 depends primarily on Pax6 transcriptional control in cortical progenitors, but activation/maintenance of Er81 expression in differentiated neurons possibly involves other regulatory factors. To identify such potential factors, we performed an in silico search for potential upstream binding sites and identified multiple binding sites for the transcription factors, REST/NRSF and Brn2, both of which are important in cortical neurogenesis [46, 47]. These transcription factors could be important for activation and/or maintenance of Er81 expression in cortical progenitors and subsets of differentiated neurons. It is interesting to note that both Pax6- and Ngn2-dependent expression of Er81 in RG progenitors in vivo is confined to progenitors of the rostrolateral cortex. To confirm the functional significance of the Pax6-dependent control sequence identified in the Er81 promoter, we developed a transgenic mouse line in which the 2 kb Er81 promoter region was placed upstream of a Cre recombinase sequence. A detailed analysis of the resulting Er81Cre line is a subject of a separate study. Results obtained thus far indicate, however, that the expression of the LacZ reporter in Er81Cre:Gtrosa26tm1Shodouble-transgenic mice faithfully reproduces the known expression pattern of Er81 in the developing telencephalon, including VZ progenitors and subpopulations of L5 neurons, striatum, piriform cortex and olfactory bulb (Fig. 2C,D; also [18, 28]. Furthermore, the reporter LacZ staining was much fainter in the medial than in the dorsal or lateral pallium. During the process of submitting this paper, Langevin et al  reported that a 2-kb region upstream of the zebrafish Er81 is active in the lateral, but not in the medial cortex of the mouse, and identified Pax6-binding sites in a 1.3-kb upstream region . Thus, it is possible that Er81 promoter activity in progenitors of the dorsal and lateral pallium (rostrally) as well as in the whole caudal pallium depends on combinatorial control by Pax6 and other transcription factors. Such simultaneous binding of Pax6 and the transcription factors, Sox2 and Maf, in the δ-crystallin and glucagon promoters, respectively, significantly increases Pax6 transactivation ability [48, 49]. Together, these findings strongly suggest that an evolutionarily conserved genetic interplay between Pax6 and Er81 is involved in the regional specification of progenitor identity in the developing cortex. In this paper we have shown that a direct genetic interaction between the transcription factors, Pax6 and Er81, in cortical VZ may be involved in the regional specification of neuronal subtype identity of a set of layer 5 projection neurons. The low-affinity binding of Pax6 to the 2-kb Er81 promoter suggests that only the high endogenous levels of Pax6 in progenitors of the rostrolateral cortex are capable of regulating Er81 promoter activity, an interpretation that is consistent with the reported regional inhibition of Er81 expression in Pax6-defficient mutants. The expression of Er81 in cortical germinative neuroepithelium in other regions and in mature neurons may involve regulation by other molecular determinants acting independently of, or together with, Pax6. CMV-Pax6  was used for Pax6 expression in mammalian cells. pGL3 basic served as the backbone for luciferase reporter constructs. Er81(mut)-Luc was generated by site-direct mutagenesis (Quick Change, Stratagene) using Er81(wt)-Luc as a template. The anti-Pax6 monoclonal (1:500, DSHB), anti-Pax6 polyclonal (1:500, BABCO), anti-GFP (1:500, Chemicon), anti-firefly Luciferase (1:100, Abcam), Alexa 488 goat anti-mouse, and Alexa 594 goat anti-rabbit (1:400, Invitrogen) antibodies were used. To identify potential Pax6 binding sites within a 2-kb region of the mouse Er81 promoter, we utilized the sequence analysis package, GCG , and the previously reported Pax6 consensus-binding site . MatInspector software was used to search for additional transcription factor binding sites in Er81 promoter . EMSA was performed as described by Bäumer et al  with some modifications. Briefly, Pax6 proteins were expressed using the TNT in vitro transcription and translation system (Promega), according to the manufacturer's instructions. Double-stranded oligonucleotides (Fig. 1A) were end-labeled using polynucleotide kinase and gramma-P32ATP. The binding reaction was performed for 1 hr on ice in binding buffer (25 mM HEPES pH7.4, 10% glycerol, 75 mM NaCl, 0.25 mM EDTA, 1 mM DTT, 0.1% Nonidet P-40, 1 mM MgCl2, protease inhibitor cocktail) containing 0.5 μg poly-dI-dC, double-stranded oligonucleotides (with radial activity at 35000 cpm) and 10 μl of in vitro-translated Pax6 protein. For antibody supershift analyses, 0.5 μl of Pax6 polyclonal rabbit antibody (Babco) was added and samples were incubated for an additional 15 min. Samples were load onto 4% TAE polyacrylamide gels and electrophoresed at 10 V/cm to resolve complexes. Gels were dried and processed for autoradiography. Chromatin was extracted from E15.5 mouse cortices. ChIP assays were performed according to the kit manufacture's instructions (Upstate Biotechnology) using polyclonal Pax6 antibodies (BABCO) to immunoprecipitate Pax6-binding chromatin fragments, with pre-immune serum and polyclonal GFP antibodies (Abcam) as immunoprecipitation controls (10 μg antibody per immunoprecipitation). A 2-kb region upstream from the starting codon of the mouse Er81 gene was amplified as an NheI/Not fragment using the Expand Long Template PCR kit (Roche) and cloned into a Cre-IRES-GFP-Intron-pA plasmid [52, 53] in pSL1180 (Pharmacia). Er81Cre mice were generated by pronuclear microinjection. Transgenic mice were identified by PCR analysis or GFP-fluorescence and maintained in a C57BL6/J background. Animals have been handled with permission of the Bezirksregierung Braunschweig in accordance with the German Animal Protection Law. HeLa cells were maintained and cultured in DMEM medium containing 10% fetal calf serum (FCS). Cells were transfected using Lipofectamine 2000 (Invitrogen), according to the supplier's instructions. The two telencephalic hemispheres were isolated under sterile conditions in Ca2+/Mg2+-free Hanks Balanced Salt Solution containing 10 mM HEPES (HBSS/HEPES). After washing twice with fresh HBSS/HEPES solution, cells were incubated for 18 min at 37°C in 0.25% Trypsin/EDTA (Sigma). The tissue was then dissociated mechanically by triturating with a fire-polished, serum-coated Pasteur pipette, then centrifuged for 5 min at 1000 rpm, washed and resuspended in DMEM medium plus 10% FCS. Primary cortical cells were electroporated using a nucleotransfection device (Amaxa) and then cultured for 3 days on coverslips coated with poly-D-lysine and Sato medium (DMEM, 100 μg/ml albumin, 100 μg/ml apo-transferrin, 16 μg/ml putrescine, 0.06 ng/ml progesterone, 40 ng/ml selenium, 5 μg/ml insulin, 1 mM sodium pyruvate and 2 mM L-glutamine) . HeLa cells or primary cortical cells were lysed and assayed for Luciferase activity according to the assay manufacturer's instructions (Promega). Chick embryos at stage 11–12 (36–48 hr old) were electroporated as described in Marquardt et al . Briefly, 2.5 μg/μl of Er81-Luc and 2.5 μg/μl of CMV-Pax6 (or CMV-Gfp) were co-electroporated into the hindbrain or midbrain of chick embryos. After 1–2 days, embryos were collected and analyzed using immunohistochemistry. At least 10 electroporated embryos were analyzed in each experiment. Embryos from timed mating were fixed and stained overnight with X-Gal at 37°C as described previously [27, 53]. We gratefully acknowledge M. Daniel and S. Schlott for outstanding technical assistance and L. Luo for helpful advice and discussions. We thank U. Franke for the generation of the transgenic mouse line. We are very grateful to M. Holt for critical comments on the manuscript. This work was supported by the Max Planck Gesellschaft and the DFG- CMPB.